If the thrust clearance is more than the maximum, replace the connecting rod assemblies as necessary. If necessary, replace the crankshaft. (a) Check that the matchmarks on the connecting rod sub-assembly and connecting rod cap are aligned. The matchmarks on the connecting rod sub-assembly and connecting rod cap are guides for correct reassembly. 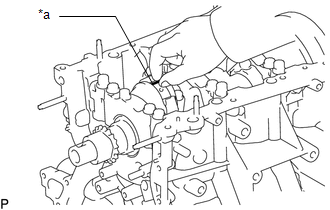 (b) Remove the 2 connecting rod cap bolts. 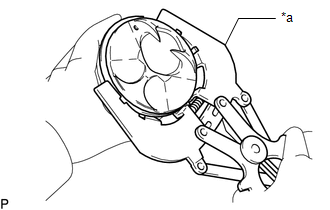 Keep the lower bearing inserted to the connecting rod cap. (d) Clean the crank pin and bearing. (g) Check that the front mark of the connecting rod cap is facing forward. 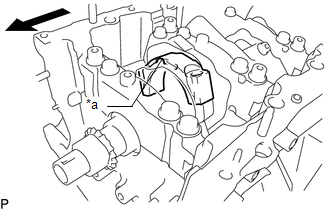 (h) Install the connecting rod cap (See page ). 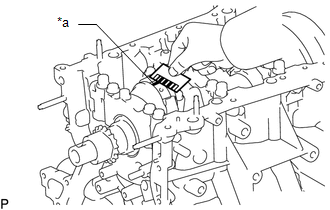 (i) Remove the 2 bolts and connecting rod cap. If the oil clearance is more than the maximum, replace the connecting rod bearings. If necessary, inspect the crankshaft. If replacing a bearing, replace it with one that has the same number as its respective connecting rod cap. Each bearing standard thickness is indicated by a number (1, 2, 3 or 4) marked on its surface. Keep the bearing, connecting rod and cap together. 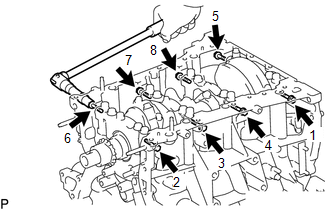 (a) Uniformly loosen and remove the 8 crankshaft bearing cap bolts and 8 seal washers in several steps and in the sequence shown in the illustration. 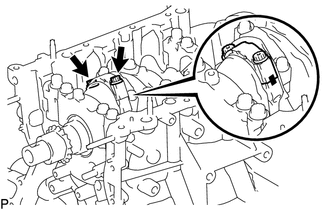 (b) Uniformly loosen the 16 crankshaft bearing cap bolts in several steps and in the sequence shown in the illustration. 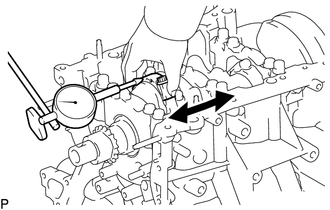 (c) Using a screwdriver, pry out the crankshaft bearing caps. 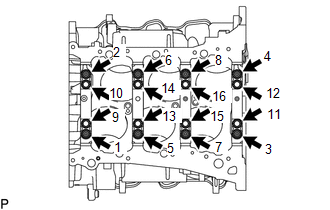 Remove the 4 crankshaft bearing caps and lower crankshaft bearings. Push up on the cap slowly and evenly, alternating from the right and left side so that the bearing cap can be removed. 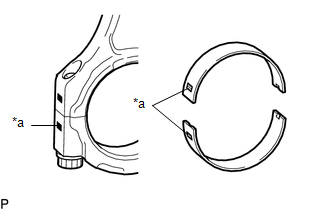 Be careful not to damage the joint surfaces of the cylinder block and the crankshaft bearing cap. 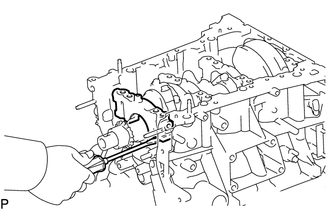 (a) Remove the upper crankshaft bearings and lower crankshaft bearings. 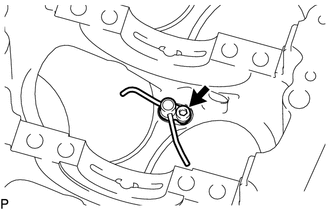 (a) Remove the upper crankshaft thrust washers from the cylinder block sub-assembly. (b) Remove the oil ring expander and 2 side rails by hand. 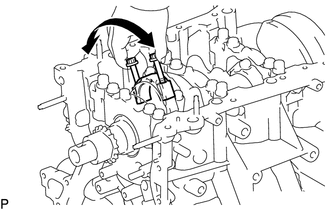 (a) Disconnect the connecting rod from the piston. (1) Using a screwdriver, pry off the piston pin hole snap rings from the piston. (2) Gradually heat the piston to approximately 80°C (176°F). (3) Using a brass bar and a plastic-faced hammer, lightly tap out the piston pin and remove the connecting rod sub-assembly. The piston and piston pin are a matched set. 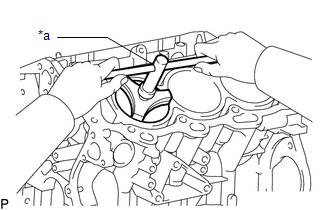 Arrange the pistons, piston pins, connecting rods and connecting rod bearings in the correct order. 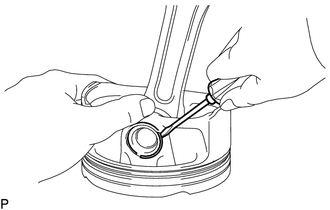 (b) Using a gasket scraper, remove the carbon from the piston top. 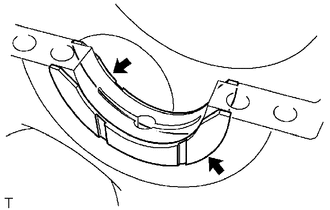 (c) Using a groove cleaning tool or broken ring, clean the piston ring grooves. (d) Using solvent and a brush, thoroughly clean the piston. 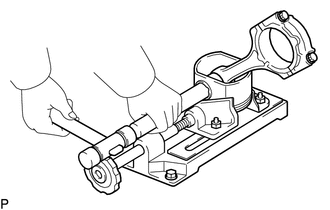 (a) Using a 5 mm hexagon wrench, remove the 3 bolts and No. 1 oil nozzle sub-assemblies. (b) Check the 3 No. 1 oil nozzles for damage or clogging. If necessary, replace the No. 1 oil nozzle sub-assembly. 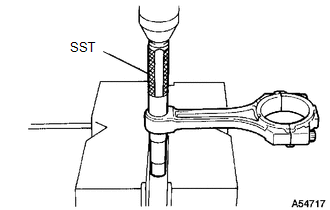 (a) Using SST and a press, press out the bush.